We have a really fun post today! 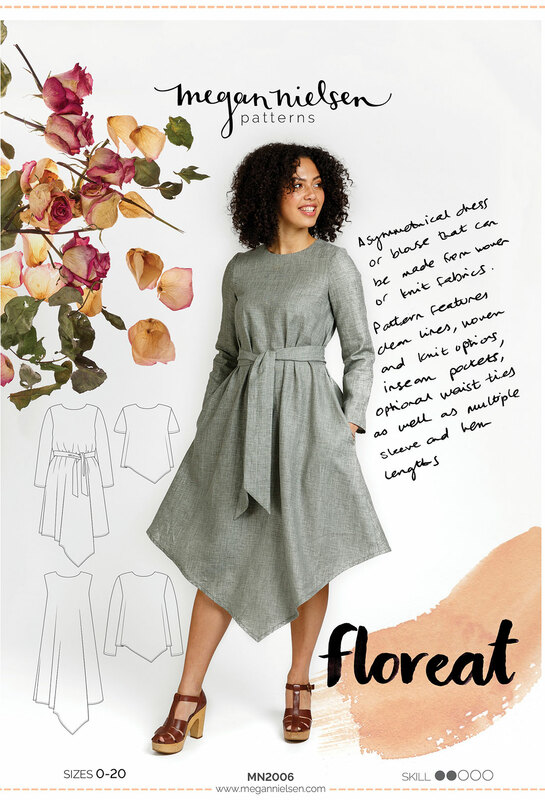 Did you know the Floreat pattern includes bonus cutting lines and pattern pieces for knit versions? It’s actually my personal favorite versions to make! 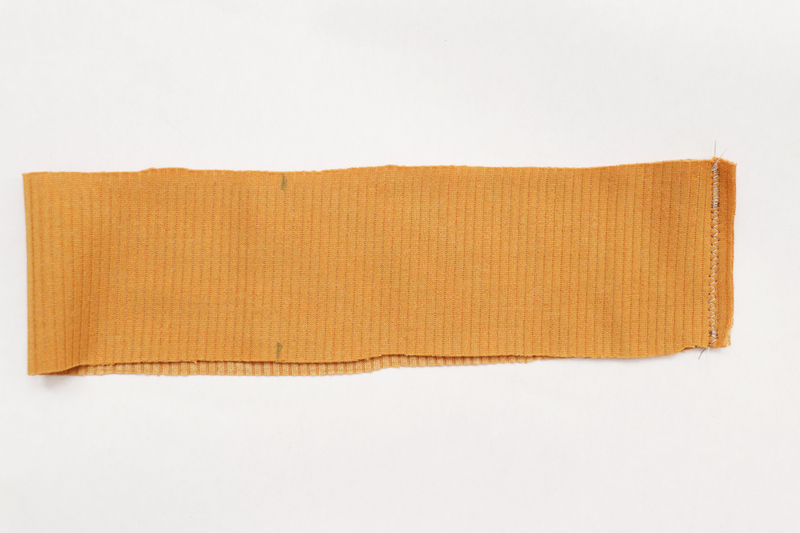 Here are some of the differences between the knit and woven versions: neckline is finished with a neckband instead of facing, no need for center back closure – so center back seam is completely sewn up, sleeves are inserted flat instead of in the round, and the hem is only folded up once instead of twice. I’ll be going over the entire construction in this post, so bear with me. And I’ll be demonstrating these steps on a top/tee version, but it works just the same for a dress! 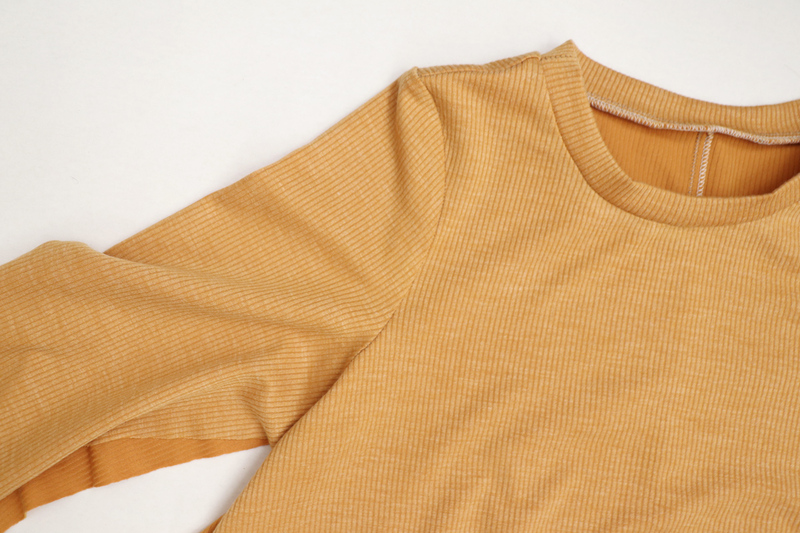 Before you get started, make sure you cut your front and back pieces out along the knit neckline cutting line. 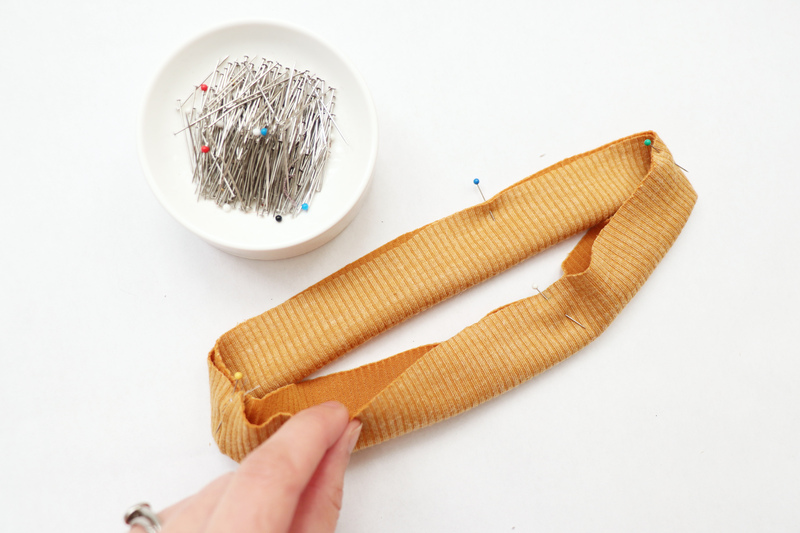 If you are making a dress and want to include a waist tie or separate tie belt, you can follow these steps here for creating that first. Then, place your two back pieces together with right sides together. Line up the center back edges and pin. Sew in place 5/8″ form the raw edge, from top to hem. 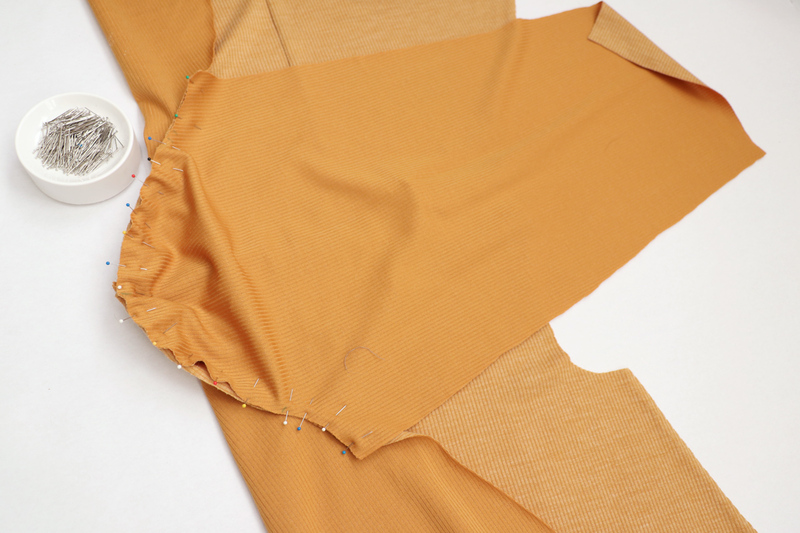 Use a zig-zag stitch or serger/overlock. Or if you’re like me, sew with a zig-zag stitch then finish the raw edge with the overlock. Press the seam either open or to the side. 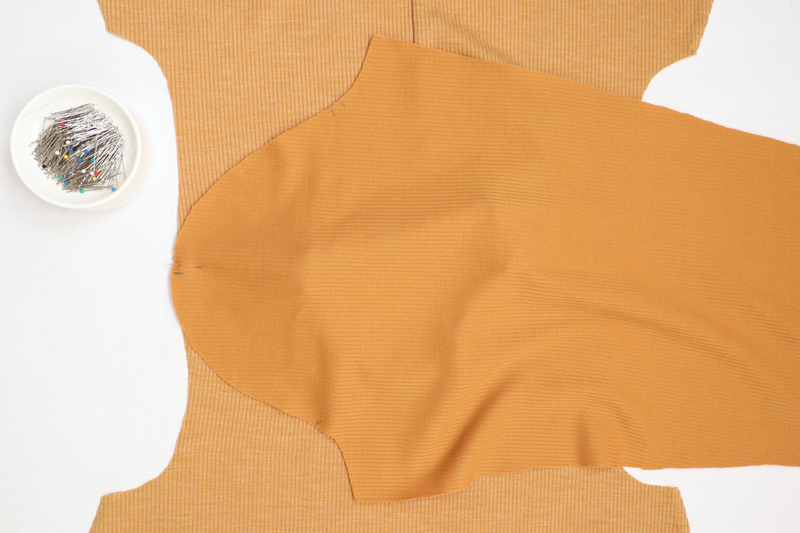 Place your front and back pieces together with right sides together. Line up the shoulder seams. 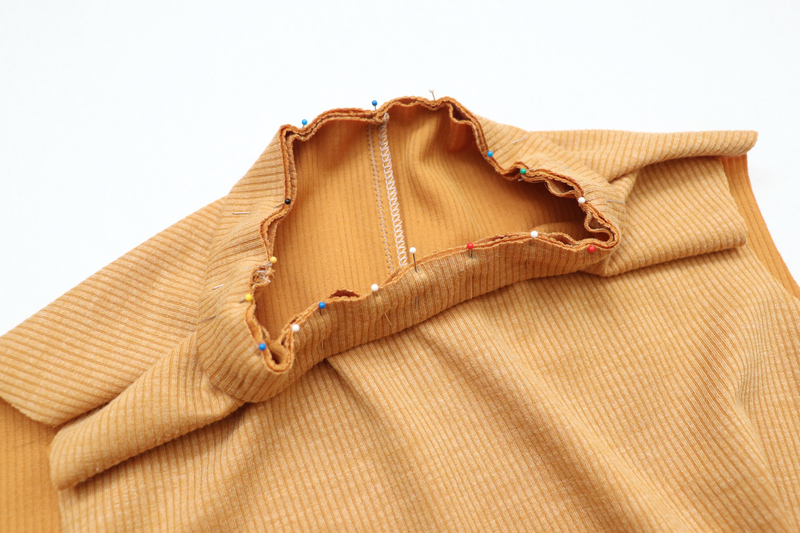 Pin in place, and sew 5/8″ from the raw edge with a zig zag or overlock/serger. Set the body of the garment aside. 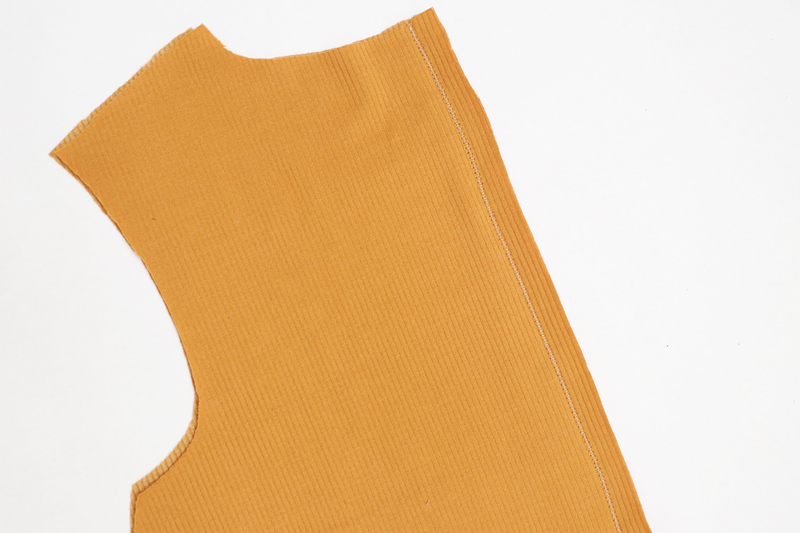 Grab your neckband, and fold in half with right sides together, matching up the shorter ends. 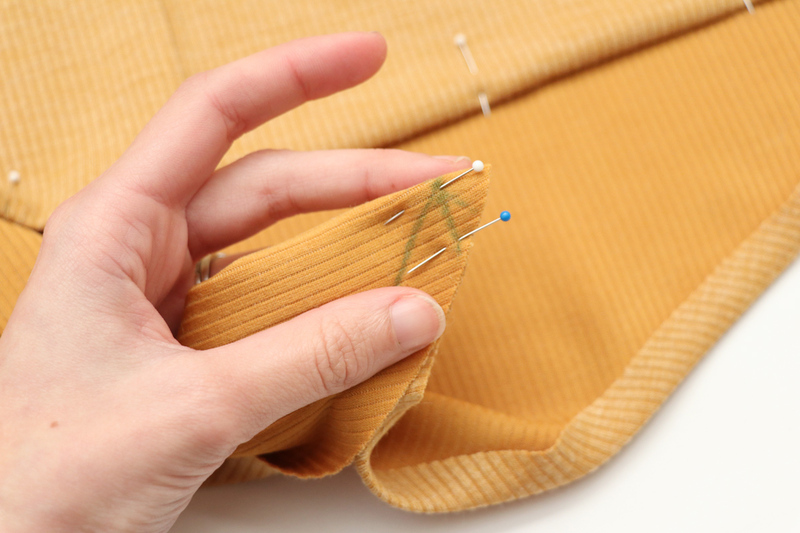 Sew in place 1/4″ form the raw edge with a zig zag stitch or overlock/serger. Press the seam flat or open. Now fold the band in half width ways with wrong sides together. The right side of the fabric should be facing out. Line up the raw edges and match of the seam and notches. 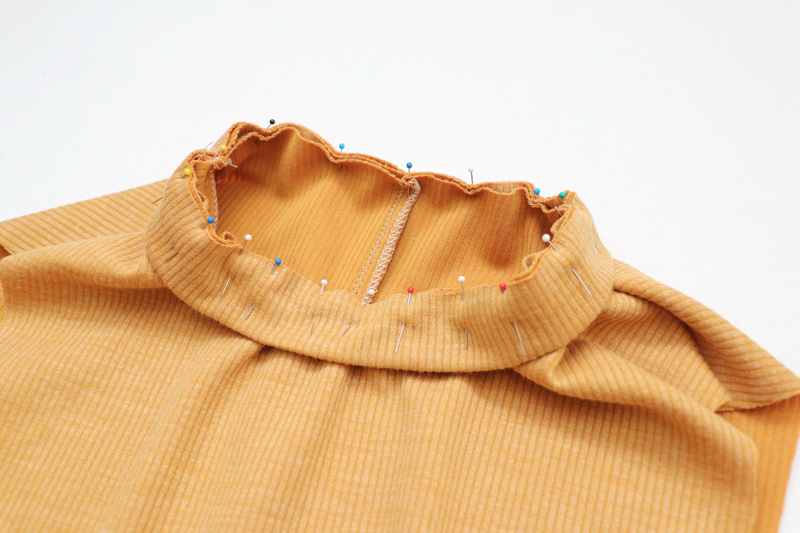 There are 4 spots to note/mark with pins – the seam, and 4 notch points along the neckband. Place your garment body in front of you right side out, so the right side of the fabric is facing you. Start pinning the band to the neckline, with right sides together. 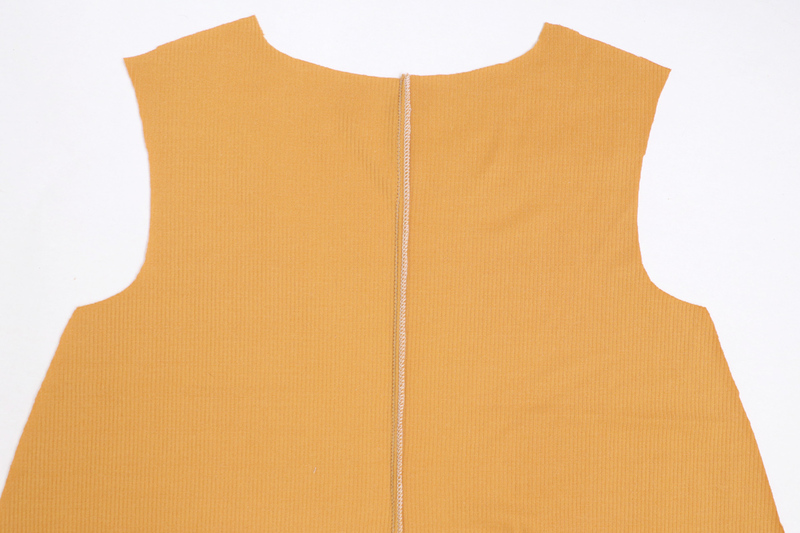 Line up the seam on the neckband with the left shoulder seam. 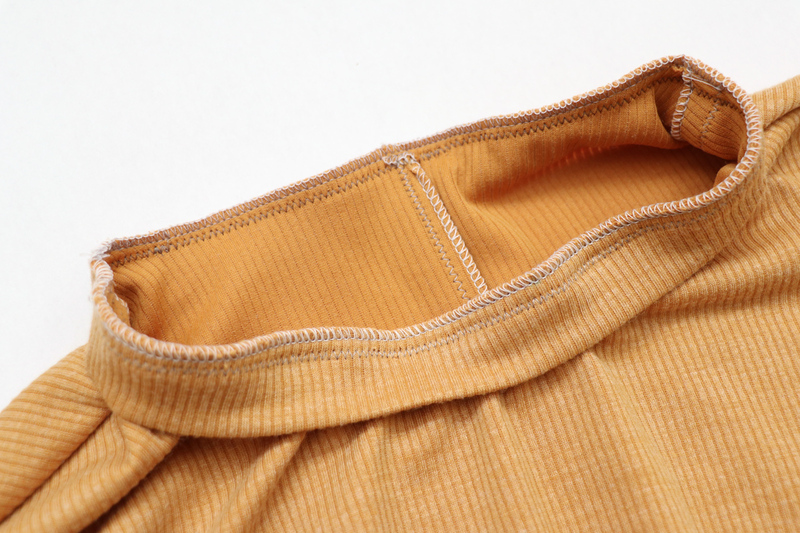 The notch on the opposite end is to be lined up with the right shoulder seam. And the other two notches are for center front and center back of the neckline. The band will be slightly smaller than the neckline. 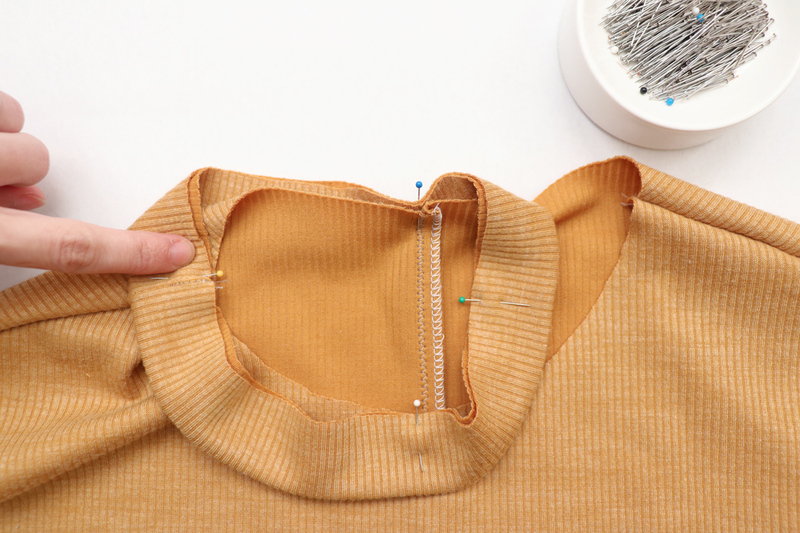 So slightly stretch it to line it up with the rest of the neckline, and continue pinning in place around the entire length. 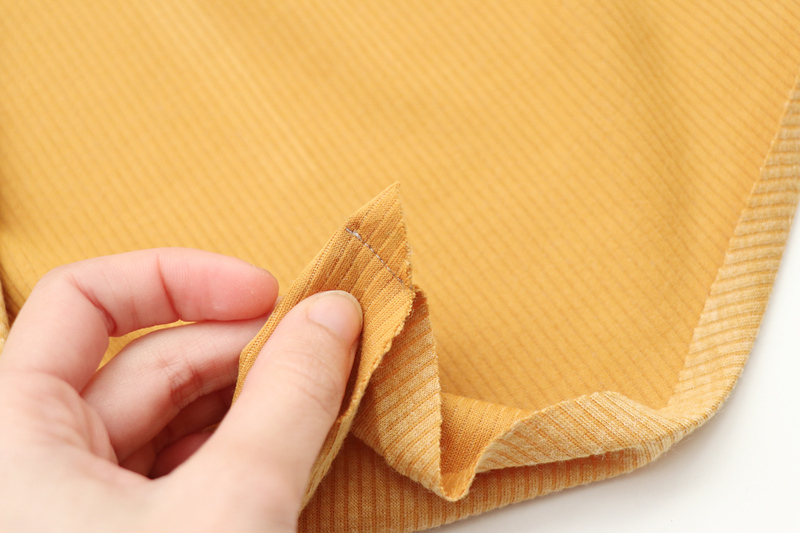 Sew together 1/4″ from the raw edge using a zig zag stitch or overlock/serger. 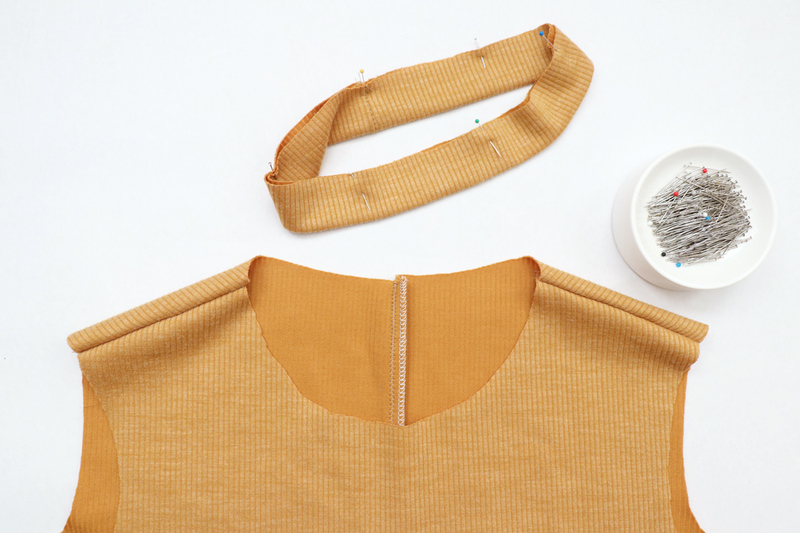 You’ll need to stretch the band slightly so that it lines up flat with the neckline as you sew. 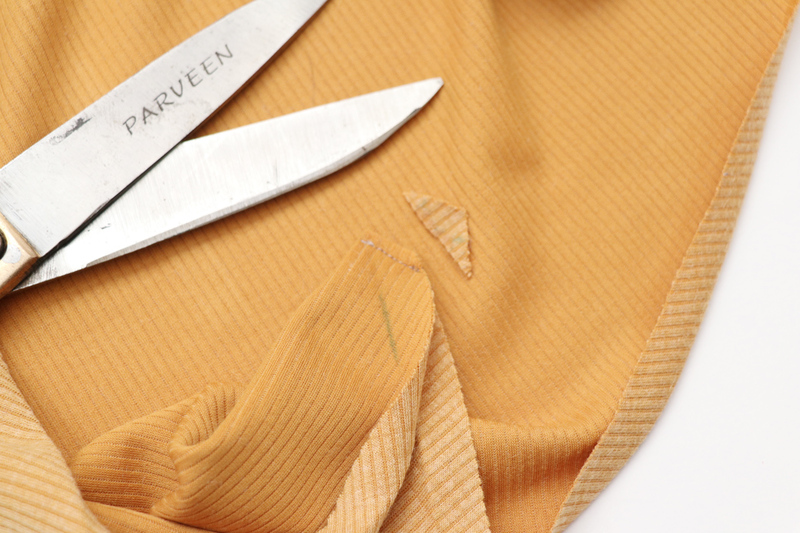 Flip the band up and away from the garment, with the seam allowance down towards the garment. Press very well – pressing is very important at this point to help it conform to the curve of the neckline and lie flat. 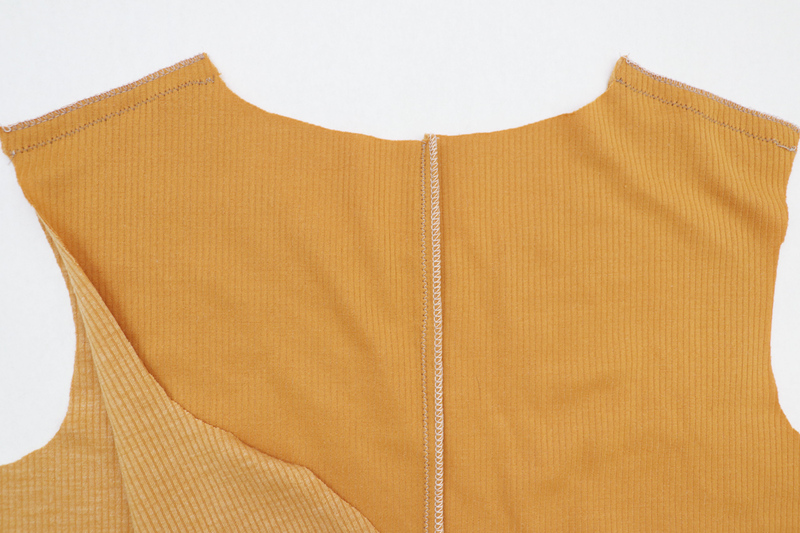 Optional- you could topstitch next to the neckline seam (along the garment, not the neckband) using a zig zag stitch or twin needle. This will also help keep the neckband lying flat. Now let’s attach the sleeves. 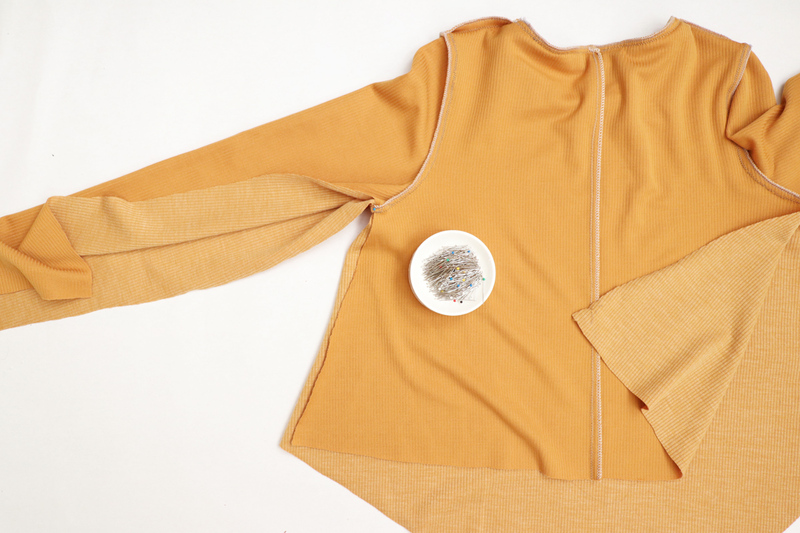 Open up your garment so it is lying flat with the right side of the fabric facing up. 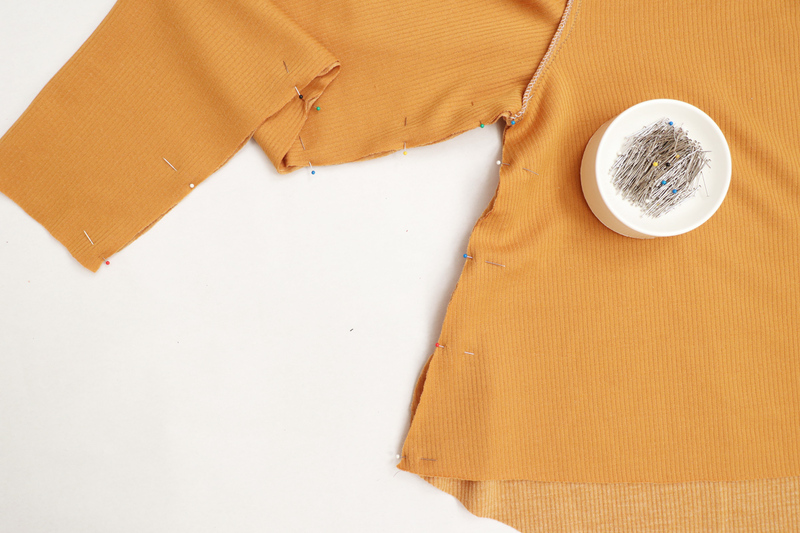 Lay a sleeve down on top with right sides together. 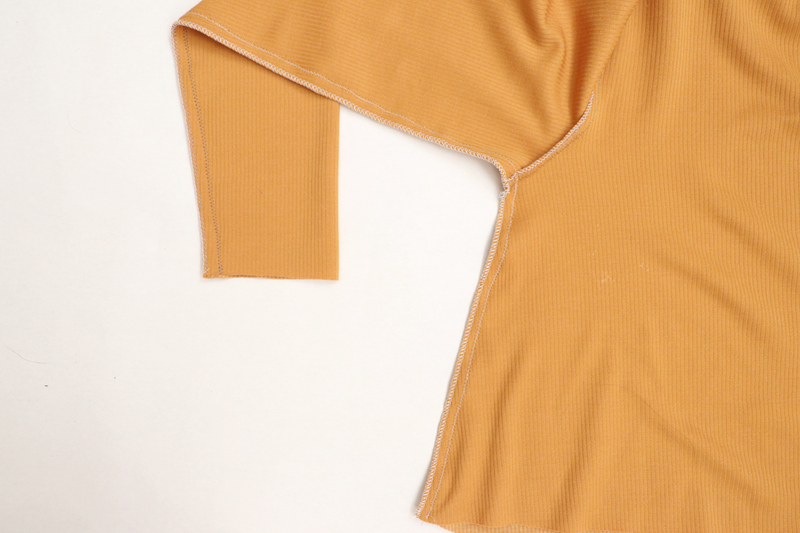 (make sure its the right sleeve, with one notch indicating the front, and two notches indicating the back). 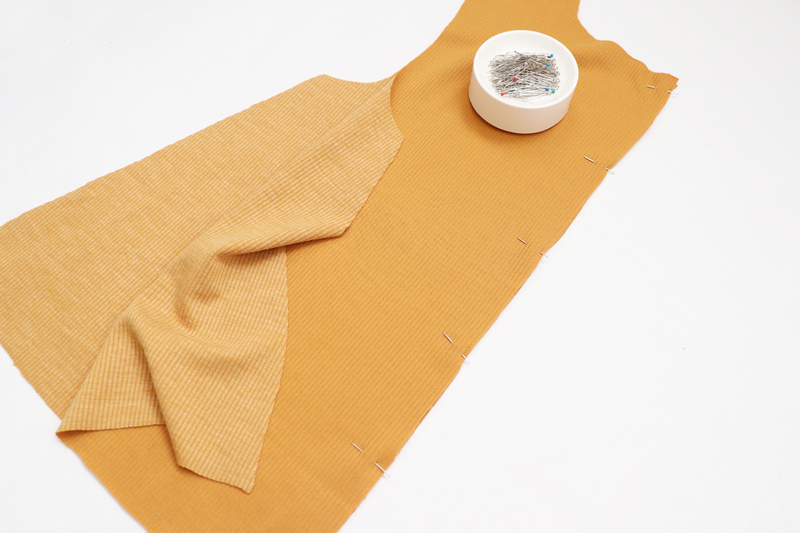 Starting with the center of the sleeve, line up the notch with the shoulder seam of the garment. Pin in place. Match up an end of the sleeve with the end of the armsyce, pin in place. Continue lining up and pinning the rest of the sleeve to the armsyce but slightly stretching and easing the sleeve as you go. 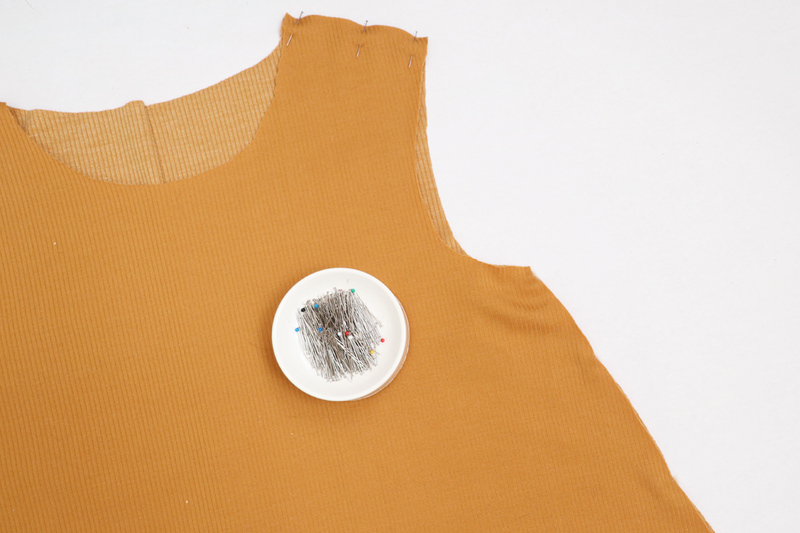 Do this until you have the entire sleeve lined up and pinned. 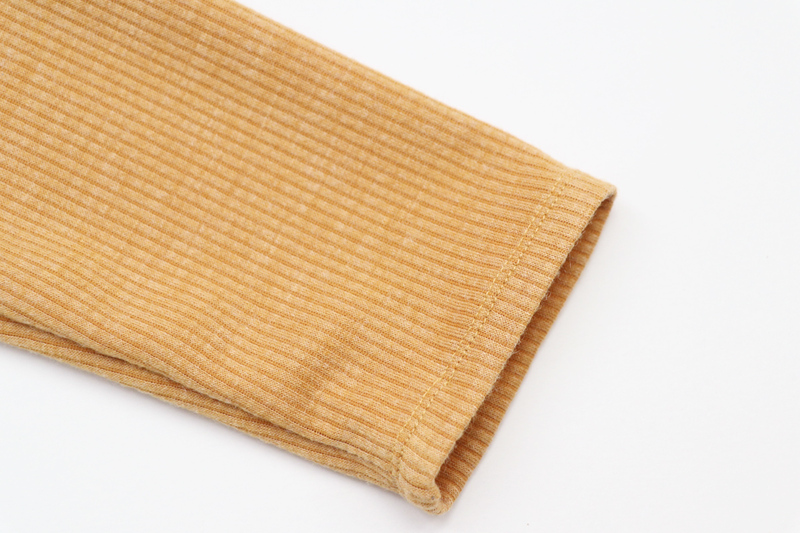 Sew around the sleeve seam 5/8″ from the raw edge using a zig zag stitch or overlock/serger. Sleeves are in! Press them well. Now, we are about to sew the side seams. 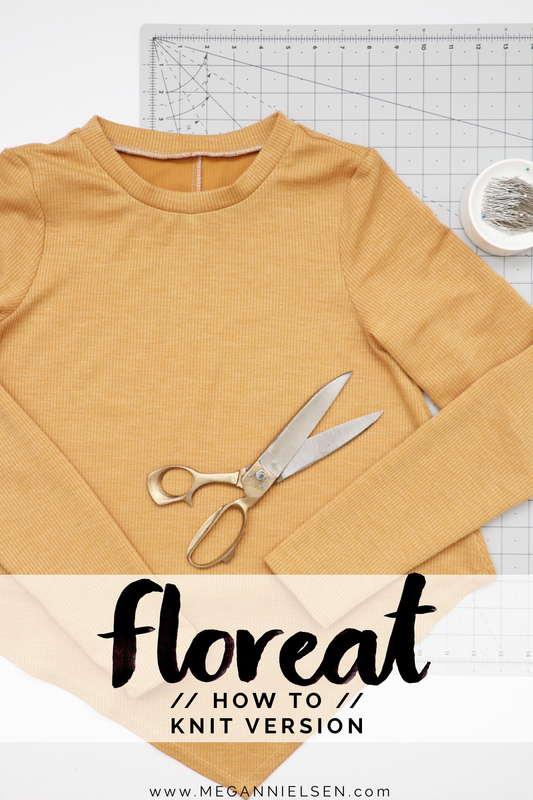 If you are making a dress and want to include pockets, follow along with this post on how to do that. 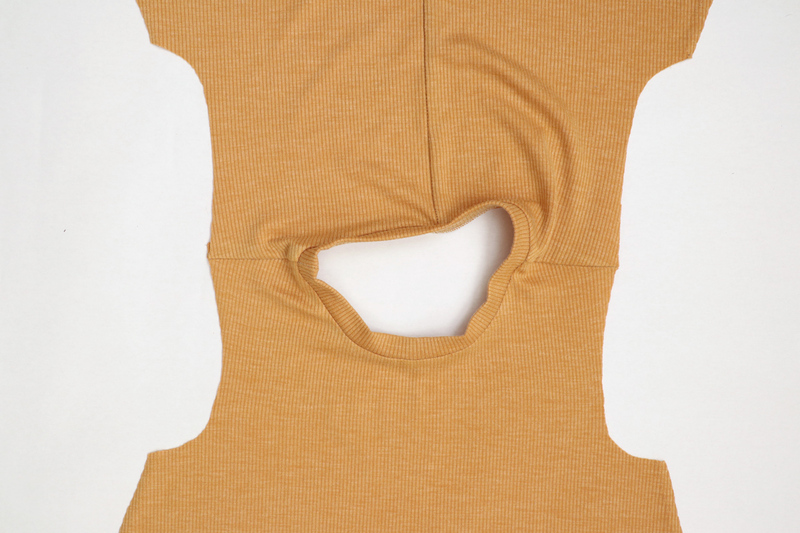 Now turn your garment inside out so that the right sides of the fabric of the front and back are facing each other. 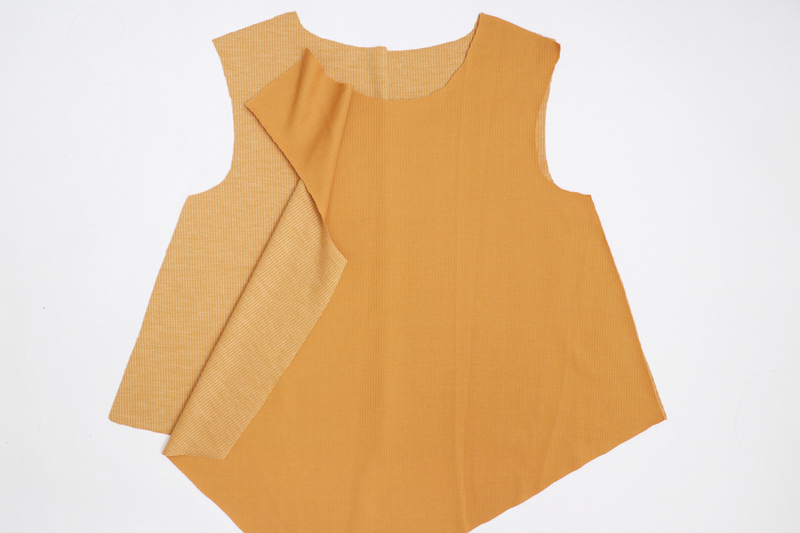 Line up the side seam of the body and sleeve, matching up the seam at the underarm. Pin in place. 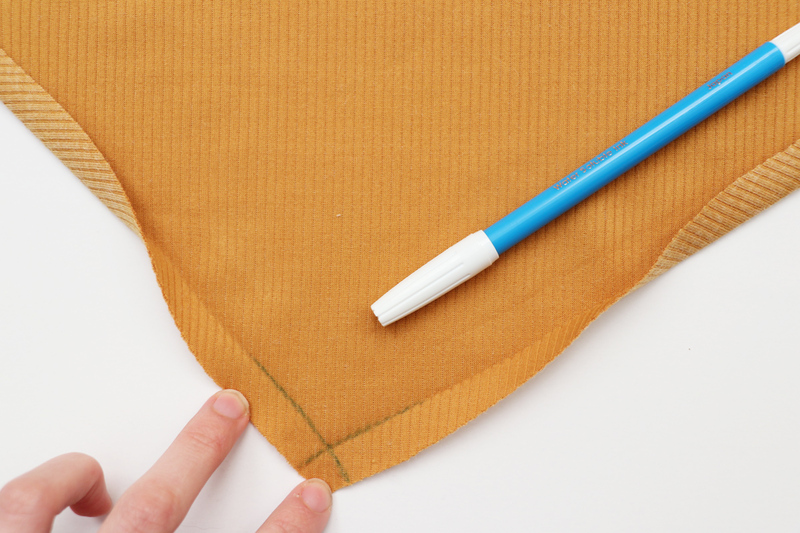 Sew the sleeve seam and side seam in one continuous line, 5/8″ form the raw edge. 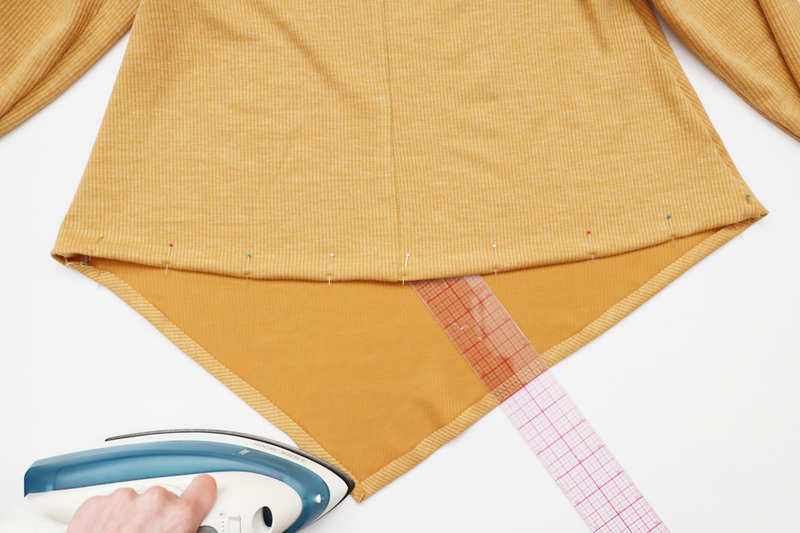 Use a zig zag stitch or serger/overlock. Press the seams either open or towards the back. 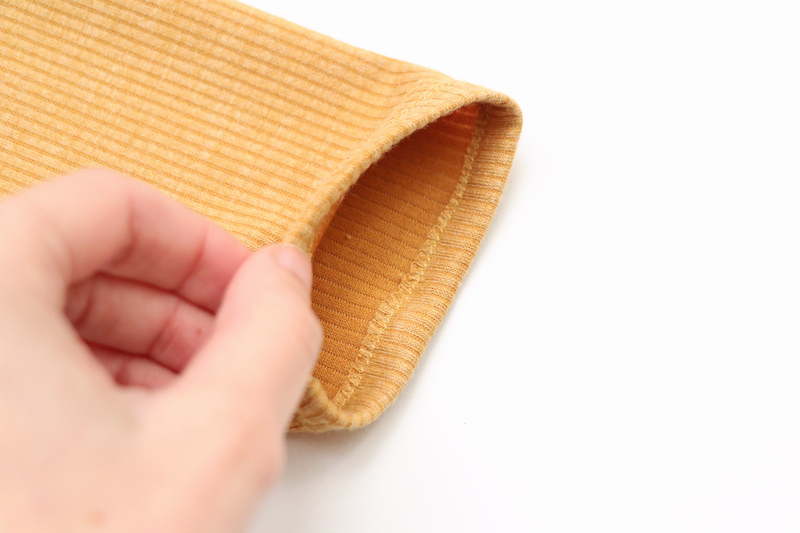 Turn the hem under by 1/2″ along the entire length of the hem, overlapping at the corner point. Press well. 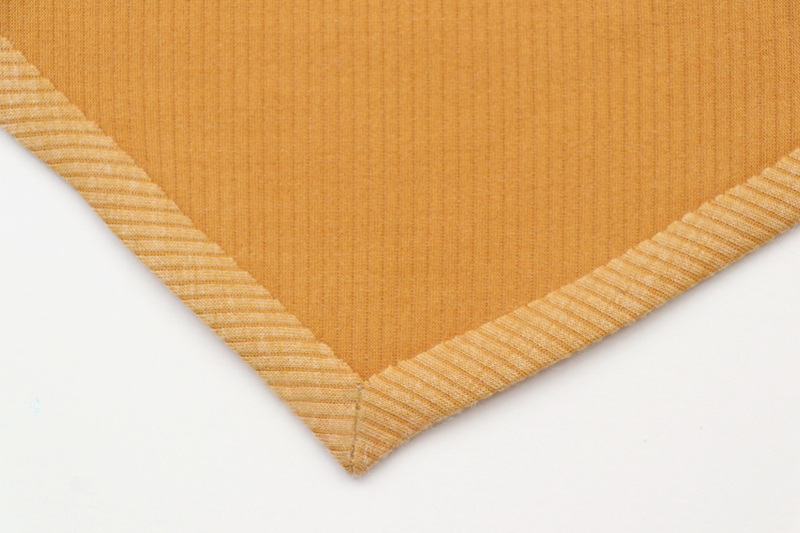 You can either just stick with this and go straight to topstitching, OR you can do a mitered seam at the corner…. 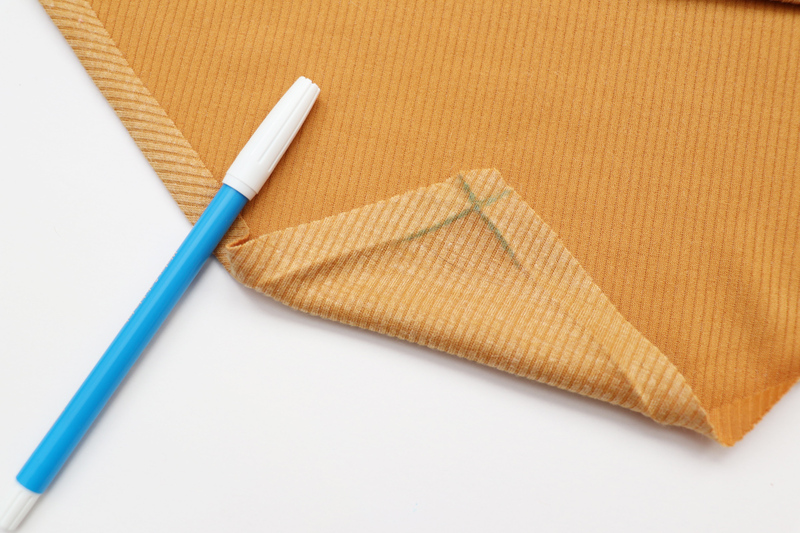 To do a mitered corner, temporarily unfold your hem at the corner, and mark the creases with a fabric marker/tailors chalk/etc. Also mark the creases from the right side of the fabric. 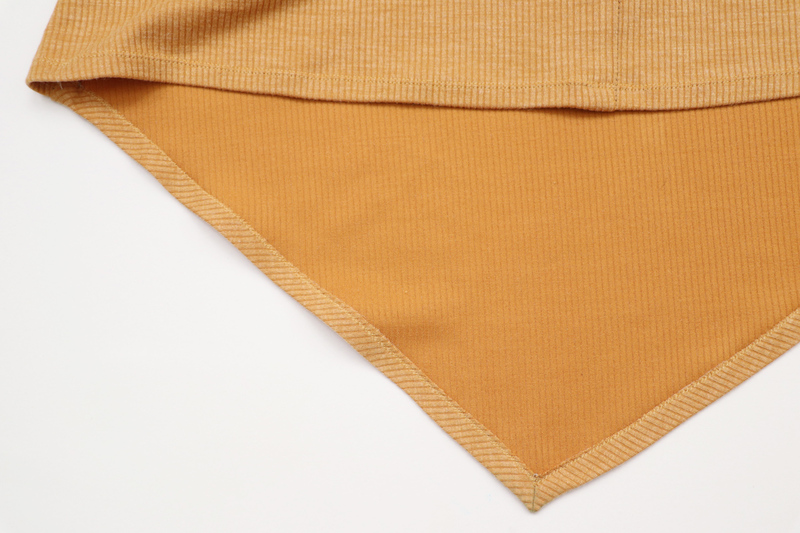 Fold up the corner towards the wrong side of the fabric, so that the crease lines line up. 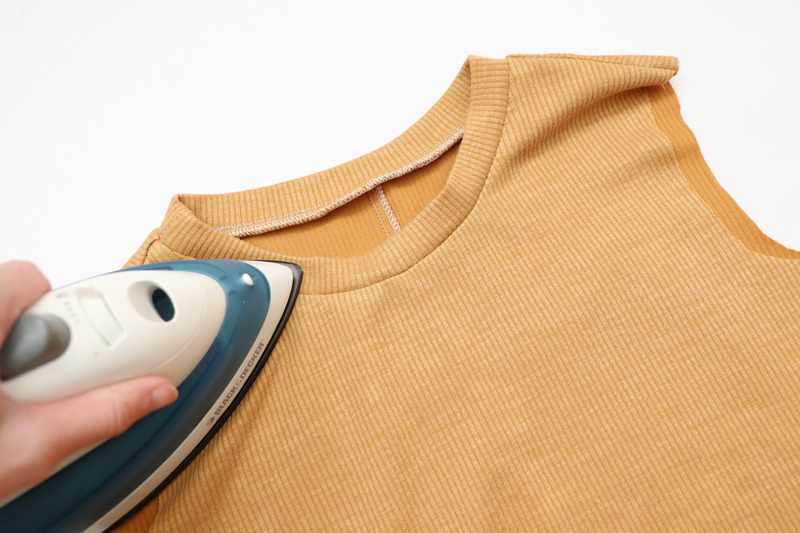 Press this corner fold well with your iron. Unfold that corner turn up once its pressed. You can see that this created a diagonal crease. Mark this crease with your marker too, if it helps. Fold the the corner of the garment in half with right sides together. Align the outer edges, and match up the diagonal crease line with itself on the other side. Pin in place. 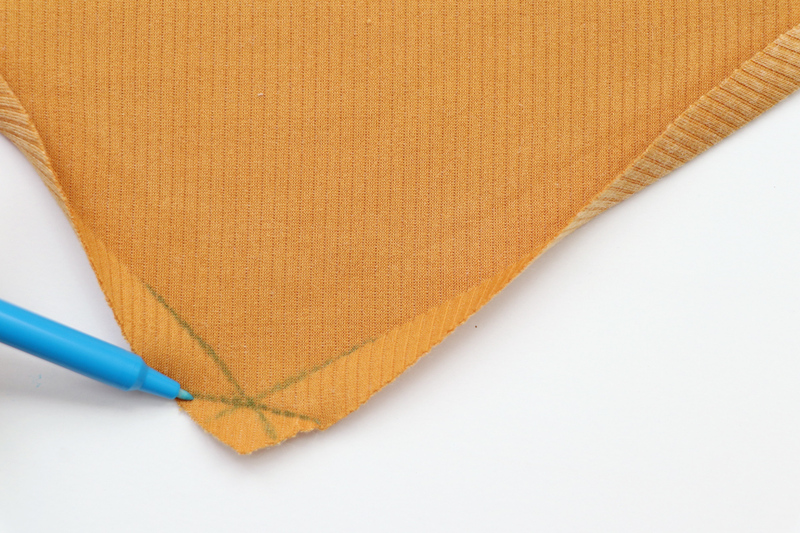 Stitch along that diagonal crease line with a regular straight stitch. Make sure to backstitch at each end to secure it. Cut off the excess fabric at the corner tip. Turn the corner back around, using a point turner tool to shape the corner. Press well. 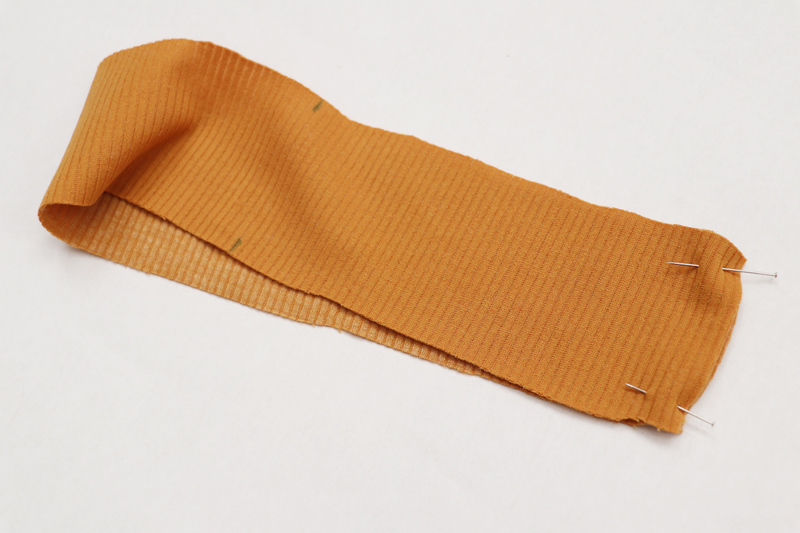 Another option is to use a fusible hem tape like stitch witchery to stabilize your hem before topstitching. Not only will this ad some stability to the hem, but also prevent it from stretching and twisting and eliminate the need for pins to hold it in place for stitching. Just simply sandwich the hem tape in between the fold of the fabric and press to fuse it together. 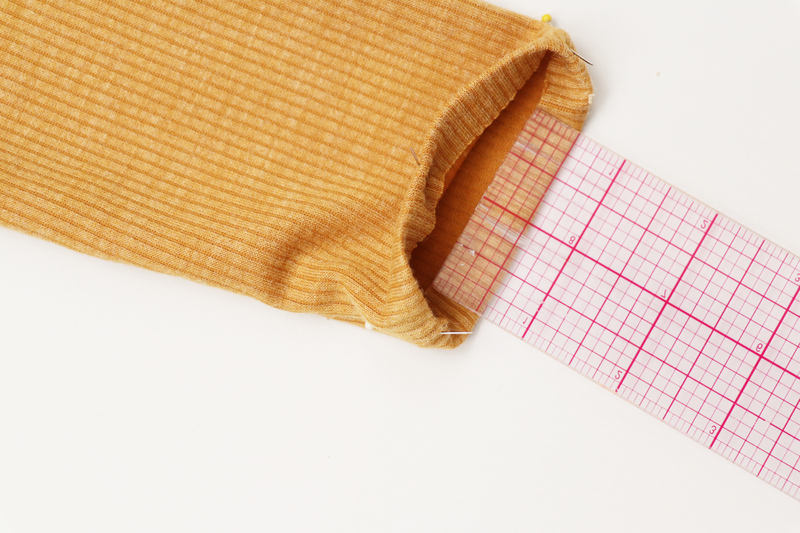 Whether you do a mitered corner or simply turn it under, or whether you use hem tape or not, now you can topstitch. 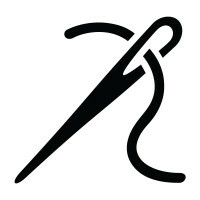 using a zig zag stitch or twin needle, topstitch just under 1/2″ from the finished edge along the entire hem, pivoting at the corner. Here it is from the inside! 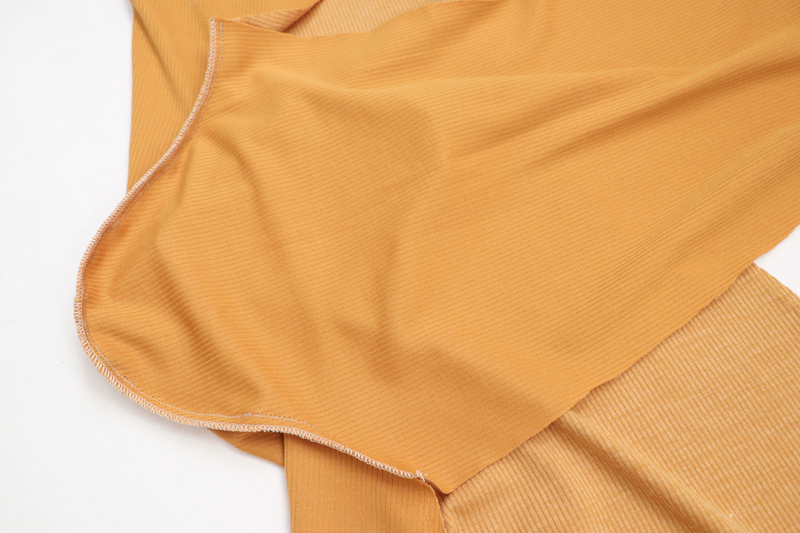 Same process for the sleeve hem, whether short sleeve or long sleeve. Fold in by 1/2″ and press. 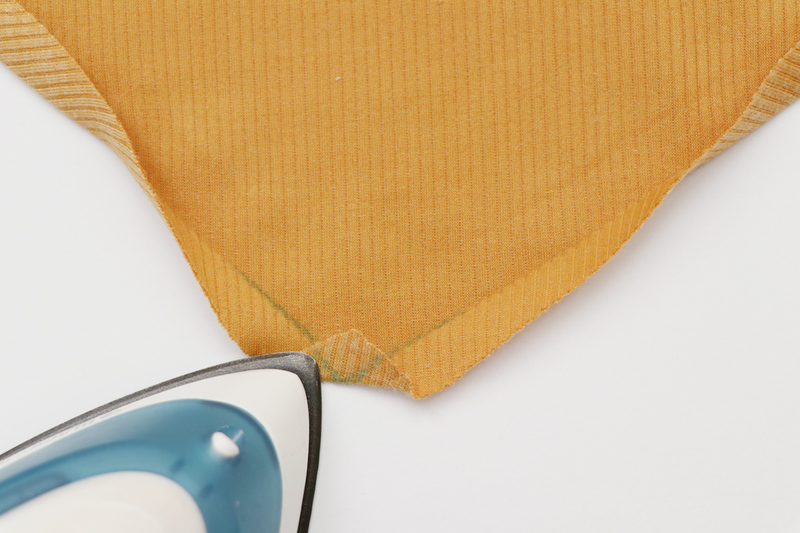 Apply the hem tape if you are using it. 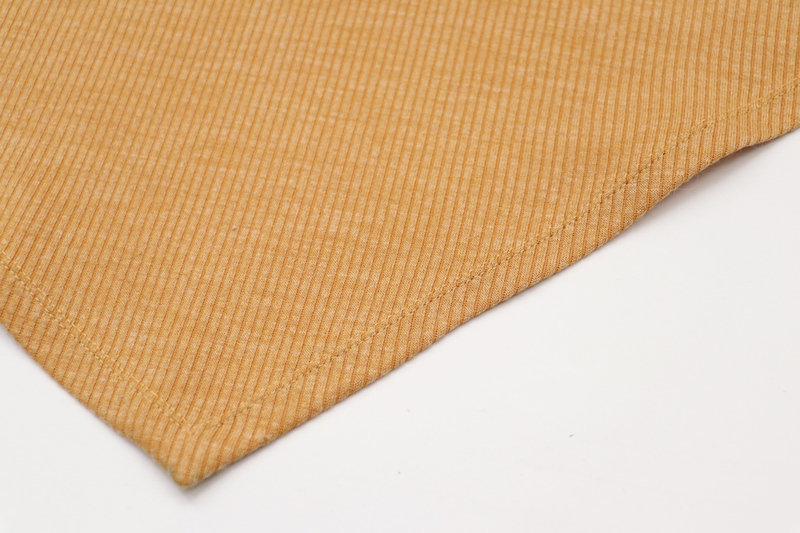 Topstitch just under 1/2″ from the finished edge using a zig zag stitch or twin needle. That’s it! Your knit Floreat is done! I am thinking about making a sleeveless knit version. Do you think that will work?